New Zealanders are convinced that they get the quality and modern urban life only on the protection of natural beauty and environment. At the same time, natural beauty also endows New Zealanders with enthusiasm and hospitality. Designers want to display the New Zealand’s natural scenery and cultural characteristics to the world through the platform of 2010 shanghai world expo. 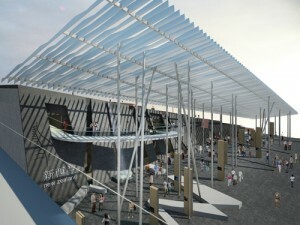 During 2010 shanghai world expo, New Zealand Pavilion will arrange lively young men, who are able to speak fluent Chinese, to receive visitors. And New Zealand indigenous Maori dance “Kapa Haka” will be performed in the pavilion every day. 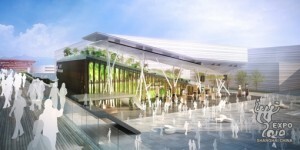 The winning tender for the design and build of the New Zealand Pavilion was submitted by a consortium comprised of international project management company Coffey Projects, architects Warren and Mahoney, visitor experience specialists Story Inc, quantity surveyors Rider Levett Bucknall leading garden designer Kim Jarrett, and technical integration company Toulouse Ltd, with engineers Beca joining the team. 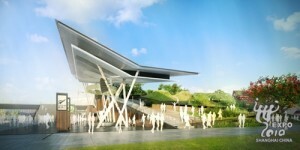 The distinctive wedge-shaped pavilion will have a projected capacity of 40,000 visitors per day. 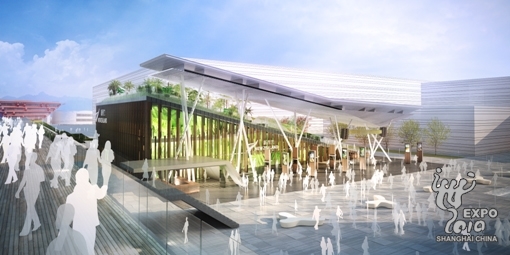 It will cover approximately 75 percent of a 2000- square-metre corner site, close to both the China Pavilion and the China Theme Pavilion, and beside the main elevated walkway. The Pavilion will comprise four visitor experience areas, described below. The front entrance to the pavilion is a welcoming veranda, a lofty canopy supported by a forest of pillars interspersed with shorter pou (pillars), many of them interactive, providing shelter for visitors watching cultural performances and queuing for entry to the interior. Inside the wedge, visitors will walk along a winding ramp that gradually rises up, taking them through a “day in the life” of a New Zealand family in a composite New Zealand city in a natural setting: from the mountains to the sea, past farmlands and bush and back towards the mountains, through a beachhouse, a school classroom and an office building. The journey will ask the question “what is a ‘better life’?” and give some possible answers in a series of sequences that look at different aspects of our “cities of nature”. Each sequence will consist of audio-visual projections, graphics, lighting and set elements. 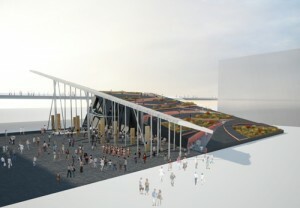 Visitors will exit the Cities of Nature experience near the top of the wedge, and will then walk back down towards the veranda area through a garden planted with New Zealand trees and flowers, and making use of sculptural elements, audio and lighting. An elegant mezzanine hospitality area located on the east side of the pavilion will be capable of hosting up to 40 guests for formal dining, or 80 for cocktail functions. It will also include a separate meeting / dining room for up to 12 people. This entry was posted on Thursday, January 28th, 2010 at 2:39 pm	and is filed under International Participants' Pavilion, Pavilion. You can follow any responses to this entry through the RSS 2.0 feed. Both comments and pings are currently closed.